Recognize the hidden costs and rewards of childrearing! The Effect of Children on Parents, Second Edition, thoughtfully explores the interactions by which parents and children change, develop, and sometimes affect each other negatively. Everyone knows that parents influence their children, but few people consider the ways in which children affect their parents. The love, satisfaction, and fulfillment children offer can change parents’lives. So can the stress, worry, and financial drain. 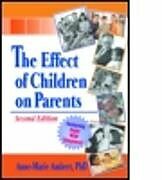 The Effect of Children on Parents, Second Edition, honestly confronts these long-neglected issues of family dynamics. Taking a unique interdisciplinary approach, this book describes in great detail, with jargon-free language the various aspects of children's effects on their parents. This second edition contains an abundance of fresh information, including nine entirely new chapters that deal with such complex topics as the effects on parents of children with emotional, behavioral, and delinquency problems. what role does genetic inheritance play in children's responses to their parents? how do peers influence children and through them, their parents? what happens to parents when children are difficult or have emotional problems? what special considerations apply to minority or adoptive parents? how do adult childrem affect their aging parents? how does society support or undermine parents? what roadblocks prevent parents from being as effective as they would like to be? The Effect of Children on Parents, Second Edition, takes a brave look at this often ignored area of family dynamics, giving a richer, more complex, and ultimately more healing view of how humans interact in families. Professors, students, and experts in the fields of child development, family studies, and sociology of childhood and family will find this book a sophisticated tool in their desire to better understand and help families and children. How Is Adoption Socially Defined? Chapter 12. Let's Not Forget About Genes! How Do Genes Interact with Environment? Do Genes Mean That Parenting is Useless? Chapter 13. Conclusions: What is Wrong with Parenting Today?